When we go on a Pilgrimage we are walking towards God. We go to God, not perfect, but as we are. We offer ourselves completely, with all our doubts, flaws, crisis, sickness, curiosity, adventure, faith, thanksgiving, and most importantly, with our Pilgrimage intentions and prayers. If you’re looking for luxury, perfection, or vacation, a Pilgrimage is probably not for you. Clearly a Pilgrimage is not a “break” from responsibilities like a vacation is – rather it is a calling; a personal invitation from God. It reminds us of our responsibility to our faith as disciples of Jesus. On a Pilgrimage, we encounter God in the very places where He has revealed himself. It can be a challenge – it can take us out of our comfort zones and incorporate tedious travel or navigating difficult terrain. Sometimes the steps are not easy, but every step counts. Remember, everything that happens while on Pilgrimage happens on the route towards God. Every step you make on your Pilgrimage are the steps that will lead you from the person you were, to the person you’re growing to be in deeper consciousness and sensitivity to God. It is a transformational experience that changes our lives and brings us closer to our faith in ways we could never imagine through sincere and concentrated prayer – that is, if you let it. There is a path in front of each of us; let’s move forward with and towards Jesus. 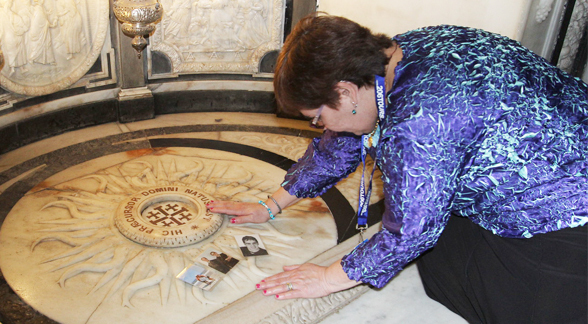 206 Tours is the most respected Catholic tour operator to the world’s sacred Holy places! In business since 1985, we have served over four hundred thousand Pilgrims to date! What sets us apart is that every 206 Pilgrimage is accompanied by a dedicated Spiritual Director who is available for daily Mass, Rosary, and Confession. Our local Catholic guides are the best in the business when leading our Pilgrims on tours to important historical and spiritual sites. We are blessed to have Pilgrimages led by renowned spiritual leaders such as, Doctor Scott Hahn, Matthew Leonard, Father Donald Calloway and more. The memories you make on your Pilgrimage with 206 Tours will last a lifetime. You will make lifelong friendships with your fellow Pilgrims and deepen your faith. Call us today for more information on our exciting itineraries and to learn how you can become a group leader yourself! Often, we go on a Pilgrimages seeking change, and often, a change takes place. Pilgrimage means focusing on an Intention, a desire, or a resolution of a situation. A Pilgrim goes because he feels called to deepen his faith and connection to God. Pilgrims seek peace with their loved one, or for peace in the world and understand that in order to find peace in their lives they must first find it with God in their hearts. Many Pilgrims find that by separating themselves from their daily lives and embarking on a Pilgrimage, they are able to find God and find peace, returning with renewed faith, transformed forever. There are so many benefits to making a Pilgrimage - people that travel on Pilgrimages, are happier, more peaceful and better suited to handle life’s difficult situations. People that go on Pilgrimages have more faith. By having more faith and peace in your heart, you do not avoid tragedy, as having Jesus in your life, is like "being thrown into the ocean with a life-vest". In previous centuries many trials were intrinsic to a Pilgrimage, while the modern-day Pilgrim has much more comfortable travel options, the purpose of Pilgrimage remains unchanged. It is a journey to a Holy, Sacred place to usher the Pilgrim into the presence of God. The pilgrim must embark on this journey with joyful anticipation, willingness to temporarily separate him or herself from the world and to offer him or herself in humble service to one another. A successful Pilgrimage involves a commitment to leave behind one's problems and to focus instead on seeking to learn more about our heavenly Father. Pilgrimages are as old as civilization. Since the earliest times, such journeys have been made as acts of devotion, penance, or thanksgiving in search of blessings or miracles. The concept of Pilgrimage crosses all ideological and religious boundaries. For example: Muslim law prescribes a pilgrimage to Mecca, the site of Muhammed’s birth for all those who are faithful and able; to bathe in the sacred waters of the Ganges is considered an obligation for Hindus; Christian pilgrims travel great distances to venerate places in the Holy Land sanctified by the presence of Jesus Christ, the Virgin Mary, and the Apostles. Pilgrimages gained popularity in the fourth century after Emperor Constantine I converted to Christianity, legalized the faith all throughout the Roman Empire and set new goals to recover important Sacred Christian relics and artifacts. He and his mother Helena became the most influential Pilgrims because of their efforts in finding Christ’s tomb, the Holy Spulchre, and the True Cross, among other relics. Word spread of their findings and by the end of the fourth century, even though travel was often perilous, Pilgrimages to the Holy Land became common. As Rome became the center of the Christian faith, it also became a frequent Pilgrimage destination, as did Greece and Egypt where Pilgrims could actually follow in the footsteps of the Apostles. By the Middle Ages, Churches and Cathedrals throughout Europe housing relics of the Holy Family, the Apostles, and early Saints, made Pilgrimage even more popular as it became a significant part of Christian devotional life. 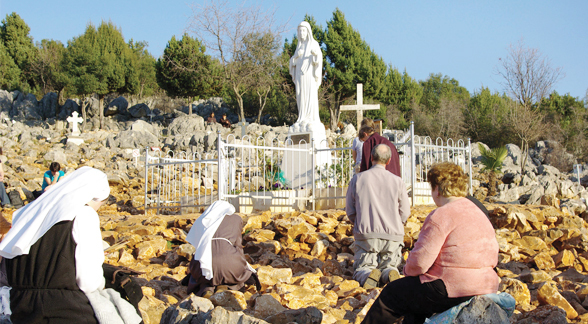 Relics play a very strong role in Pilgrimage. There are several types of relics, first-class relics are items that played a role in the life of Jesus Christ and are the most Holy relics in the word. The remains of a Saint, also referred to as Corporeal Relics are also first-class relics and are often entombed in a Shrine. Second-Class Relics are typically a personal belonging of a Saint or Holy person, often clothing. Notre Dame Cathedral in Paris enshrines part of the Cross of Thorns, wood from the Cross, and a nail from the Crucifixion. In Aachen, Germany you can find the swaddling clothes of the infant Jesus and the Virgin Mary’s veil. The Shroud of Turin, Christ’s burial cloth, is kept in the Royal Palace of Turin in Piedmont, northern Italy. The heart of St. Vincent de Paul resides in a reliquary in the alter of his Shrine in Paris, the mother house of Sisters of Charity. All ages are welcome on all 206 Tours Pilgrimages! A Pilgrimage is an amazing experience for anyone – especially children. Watch as your children experience a new culture, learn to travel, deepen their faith, and grow as individuals. Create a meaningful memory for your children that will become the foundation for them to build their relationship with God upon. 206 Tours management and employees are pleased you have chosen us to arrange your Pilgrimage. We are committed to doing all we can to ensure that your adventure of approaching the Lord's holy and sacred sites is comfortable, pleasant, and deeply spiritual. 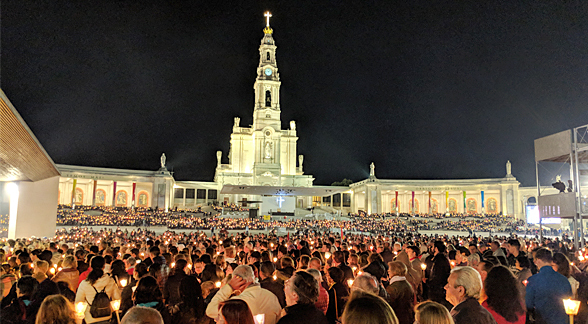 Our goal is to arrange beautiful and spiritual Pilgrimages, ministering to those seeking the Lord, leading our pilgrims to discover God in our World’s Holiest sites. What about the cost of a Pilgrimage? Living on earth is an experience – journey beyond your neighborhood to make the absolute most of the experience. In some cases, a Pilgrimage can be less than annual cable bill or several nights out at a fancy restaurant. We have one-week all-inclusive pilgrimages that are under $2,000 - including airfare, meals, transfers, sightseeing, tour escorts and experience that you can never replace by any material item. For large or small groups, we will work together to design a unique and memorable pilgrimage. Our agents are knowledgeable in both group sales and operations. Pilgrimages are ideal for family reunions, church groups, youth groups, student groups, class reunions, senior citizens, singles, interest groups, neighbors, couples or anyone seeking the spiritual refreshment that only a Pilgrimage can provide. Simply choose a destination and indicate the most desirable departure date. We will design and print flyers at no cost to you. For further details and incentives, please call us at 1-800-206-TOUR (8687), and we will be happy to guide you through each step. And remember, if you don't find an itinerary you like on our website, tell us and we'll gladly customize a pilgrimage to accommodate your requirements (minimum of 20 people).